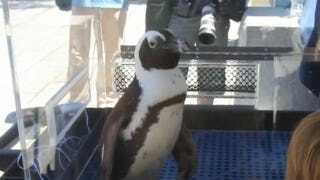 Residents of the Hannah Duston Rehabilitation Center, a nursing home in Massachusetts, are soon going to be getting a visit from a very special tuxedoed gentleman, Roast Beef the African penguin. He lives at the New England Aquarium, but he is specially trained to visit schools and community events. The five-pound penguin even travels in his own air-conditioned crate. This will be Roast Beef's first time at a nursing home, but aquarium officials aren't worried because, they say, "Penguins are clearly loved by all ages." Clearly. It's bound to be a magical visit, since Roast Beef's nickname is "The Ladies Man."